This long approximately 10" x 50" Vera Neumann scarf features a white background of satin finished silk through the center and white sheer on the edges. There are large long stem red roses with green leaves spaced throughout the center solid white background area of the scarf. 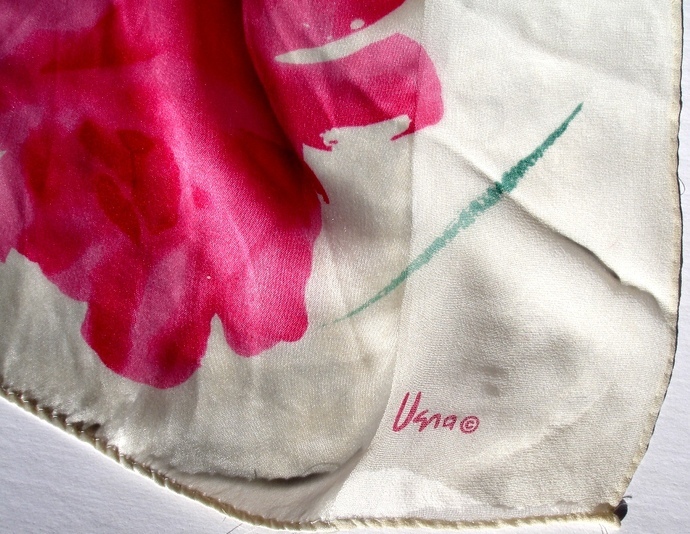 The beautiful Vera scarf dates from the mid 1950's with its very small Vera with copyright symbol. It is a very rare find and is in very good condition for its age as it only has several dents throughout the scarf ,these very small imperfections are not visible to the naked eye when you are wearing this scarf only if held up to a bright light and looking for them. There are three small marks along the edge of the scarf that may be from eye makeup but they are very small and not noticeable unless you are looking for flaws. There are no rips, no tears present on this beautiful vintage scarf. This lovely long Vera scarf in white with red roses and green leaves will give you many years of colorful enjoyment and will add a chic splash of vibrant color to your outfit of choice. This is a great "Gift for Her"! When you give a Vera scarf you are not only giving a beautiful scarf you are giving a beautiful wearable piece of art history! This Vera Neumann Long Scarf In white With Red Roses And Green Leaves will ship USPS Priority Mail with Delivery Confirmation in the United States.